The Para 3 takes all the proven features and benefits of Spyderco's best-selling Para Military2 and distills them into an even more compact all-purpose cutting tool. Its 3" blade is precision machined from premium CPM S30V particle metallurgy stainless steel and features a full-flat grind for a superior balance of strength, point utility, and low-friction cutting performance. It includes a textured index-finger choil and thumb ramp that provide a solid purchase for a forward grip and offer enhanced control during precise cutting tasks. 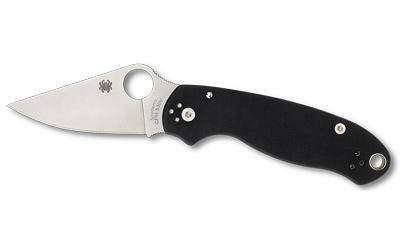 The blade's signature Trademark Round Hole clearly brands it as a member of the Spyderco family and is fully accessible to allow quick, positive, one-handed opening with either hand.